What is the origin of the 7-day week? What do the names of the days of the week mean? What is the system behind the planetary day names? Has the 7-day week cycle ever been interrupted? Which day is the day of rest? Do weeks of different lengths exist? The Christian, the Hebrew, the Islamic, and the Persian calendars all have a 7-day week. Digging into the history of the 7-day week is a very complicated matter. Authorities have very different opinions about the history of the week, and they frequently present their speculations as if they were indisputable facts. 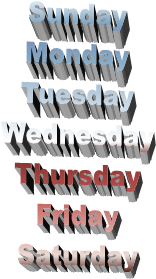 In short, nothing can be said with certainty about the origin of the 7-day week. Extra-biblical locations sometimes mentioned as the birthplace of the 7-day week include: Babylon, Persia, and several others. The week was known in Rome before the advent of Christianity. An answer to this question is necessarily closely linked to the language in question. Whereas most languages use the same names for the months (with a few Slavonic languages as notable exceptions), there is great variety in names that various languages use for the days of the week. A few examples will be given here. Note the difference in numbering in these two languages: In Portuguese Wednesday is called “the fourth day”, quarta-feira; but in Russian Thursday is called “the fourth day”, chetverg. The link with the sun has been broken in French, but Sunday was called dies solis (day of the sun) in Latin. English has retained the original planets in the names for Saturday, Sunday, and Monday. For the four other days, however, the names of Anglo-Saxon or Nordic gods have replaced the Roman gods that gave name to the planets. Thus, Tuesday is named after Tiw, Wednesday is named after Woden, Thursday is named after Thor, and Friday is named after Frigg. Moon, Mars, Mercury, Jupiter, Venus, Saturn, Sun. Moon, Mercury, Venus, Sun, Mars, Jupiter, Saturn. Arrange this sequence of planets anticlockwise on a circle, as in the illustration to the right. Now, starting with the Moon (Monday) count the 24 hours of the day clockwise around the circle: 1-Saturn, 2-Jupiter, 3-Mars, 4-Sun, etc. until you reach 24-Mars. Mars (Tuesday) is now the next starting point. 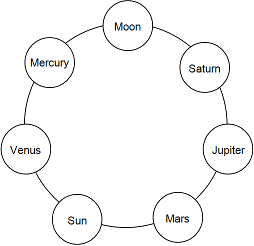 Once again, count clockwise around the circle: 1-Sun, 2-Venus, 3-Mercury, etc. until you reach 24-Mercury. Mercury (Wednesday) is now the next starting point. If you continue is this way, each time noting the 24th planet, you will visit the planets in this order: The Moon (Monday), Mars (Tuesday), Mercury (Wednesday), Jupiter (Thursday), Venus (Friday), Saturn (Saturday), the Sun (Sunday), after which you return to the Moon (Monday). In other words, you visit the planets in exactly the order of the associated week days. Coincidence? Maybe. There is no record of the 7-day week cycle ever having been broken. Calendar changes and reform have never interrupted the 7-day cycles. It is very likely that the week cycles have run uninterrupted at least since the days of Moses (c. 1400 BC), possibly even longer. Some sources claim that the ancient Jews used a calendar in which an extra Sabbath was occasionally introduced. But this is probably not true. For the Jews, the Sabbath (Saturday) is the day of rest and worship. On this day God rested after creating the world. Most Christians have made Sunday their day of rest and worship, because Jesus rose from the dead on a Sunday. Muslims use Friday as their day of rest and worship. According the Muslim Hadith writings, Friday is the king of all days because Adam was created and died on a Friday, and judgement day will be a Friday. The Bible clearly makes the Sabbath (corresponding to our Saturday) the last day of the week. Therefore it is common Jewish and Christian practice to regard Sunday as the first day of the week (as is also evident from the Portuguese names for the week days). However, the fact that, for example, Russian uses the name “second” for Tuesday, indicates that some nations regard Monday as the first day. In international standard ISO 8601 the International Organization for Standardization has decreed that Monday shall be the first day of the week. Most years have 52 weeks, but all years that start on a Thursday and leap years that start on a Wednesday have 53 weeks. Note: This week numbering system is not commonly used in the United States. If n > 364 + s, the day lies in week 1 of the following year. + 1 of the current year. f + 1 is the ordinal number of the date within the current year. The ancient Egyptians used a 10-day “week”, as did the French Revolutionary calendar. The Maya calendar uses a 13 and a 20-day “week”. In calendrical calculations, we frequently use an operation call integer division. Ordinarily we would say that, for example, 14 divided by 5 is 2.8. But when we use integer division, we discard the decimal fraction and simply state that 14 divided by 5 is 2. When we perform integer division, the division leaves a remainder. In the case of 14 divided by 5, the remainder is 4: We can subtract 5 twice from 14, and this leaves us with 4. ^  http://library.faizaneattar.net/Books/Pages_en.php?id=314&img=4, retrieved 12 August 2011, quoting Sunan ibn-e-Majah, V2, P8, Hadith 1084, Dar-ul-Ma’rifa, Beirut.